- You may prepare for various battles with the "Troops" Menu. - Select the category from the top menu and select the unit for exchange. - Select the exchange button on the right and the two units will be replaced. - The same process can be applied to exchange the equipment worn by the unit. - If you press "Select" on the left, the set can be saved depending on the use. 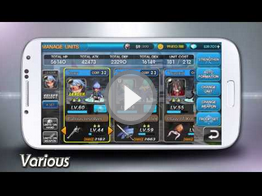 - You may save up to Max 5 sets and the 5th set will be used as a defense deck in battle. - Select the unit/weapon in the strengthen menu. - Select the "Strengthening Target" on the left. - Select the unit to strengthen. - Go into "Select Subject" from the previous stage and select the unit as your subject. - The unit used for the subject will disappear if you decide to proceed with the strengthening process. - Select "Start Strengthening" on the right and the target unit will be strengthened. - Summon types are divided into unit/weapon summons. - SP or Gold obtained from battles can be used for general summons. - Tickets or Cubic earned from gameplay can be used for premium summons. - You can evolve 4 star units/weapons into 5 star units/weapons or 5 star units/weapons into 6 star units/weapons. - You can use 3 unit/weapon ingredients to either obtain a top rank or lose one of the ingredients to either obtain a top rank or lose one of the ingredients. - Select the ingredient from the list and press the "Start Evolving" button in order to start the evolution. - 100K gold is used for 4 star evolution and 300K gold for 5 star evolution.